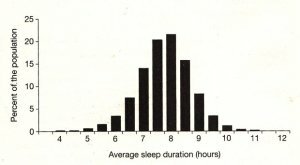 Our need for sleep falls on a bell curve – most people need between seven and eight hours a night, although some manage on four and others need twelve. I have always fallen on the right hand tail… I am neither a night owl nor a morning lark but a permanently exhausted pigeon. As a child I never had a bedtime, I would happily put myself to bed when I was tired. My mum and one of my brothers are the same whilst my other siblings and dad can manage on just a few hours. Since I started dealing with this mood disorder, it became very obvious that sleep was a very accurate symptom of going too high or too low. When I am too high I manage on just a couple of hours a night, getting up full of energy to start my next project. When I am too low, I wake early and yet find it impossible to get up. It is a good sign and one that can be quantified. Keeping an eye on my sleeping pattern means that I can catch myself slipping before it becomes an issue. Then you add the drugs into the mixture… medication that totally exhausts me, that sedates me and means that I end up spending more afternoons than I like to admit asleep on the sofa. I know that I need sleep. I know that I cannot last long without it and that if I want to stay well then I have to my sleep-wake rhythm in check. A late night or a lie aren’t the end of the world but keeping on an even keel is important. It might mean my clubbing days are over (all two of them), but I can live with that if it means that I stay out of hospital and on top of the illness.